Bus Simulator 18:The highly anticipated bus simulation game for PC will be ready to depart from its depot earlier than expected. The new release date is June 13, 2018. 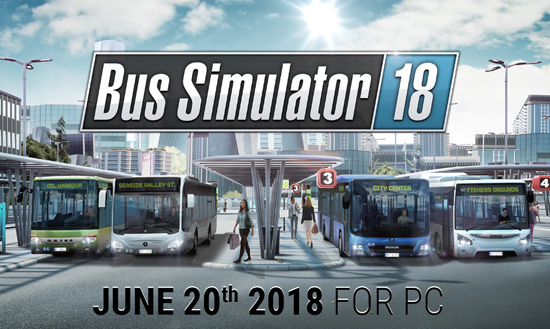 In Bus Simulator 18 players will have the unique opportunity to manage their very own bus company either as a single-player or together with friends in the game’s synchronous multiplayer mode. In the fictional European city of Seaside Valley, which has been created using Unreal Engine 4, virtual bus drivers can take the wheel of eight licensed busses by four famous makers. After completing a closed beta test in the last month, the very positive feedback coming from the player community resulted in some suggestions for improvement that the developers of stillalive studios were able to implement faster than originally expected. This results in bringing the release of Bus Simulator 18 forward by one complete week! Hurray!